Lyn is 58 years old. She lives with her daughter in Melbourne’s north, and they have experienced several energy disconnections. Lyn is a survivor of domestic violence, and her financial problems stem from there. After years of abuse Lyn took out an intervention order against her husband. So I found myself, all of a sudden without thinking about how I’m going to survive; we still had to manage the mortgage and everything. He just stopped paying it… For a little while he kept the payments up but then he met somebody and then the payments stopped. Lyn found some casual work and began to get her life on track. About a year later, though, she injured her back and could not work. Eventually Lyn’s back improved and she found a new job, but then she suffered four heart attacks related to a nervous system condition, and has been unable to work ever since. Debts piled up. Sometimes Lyn would go several days without eating so she could feed her daughter. Disconnections could last for weeks, and Lyn tried to shield her daughter from the impacts. One night when the electricity had been cut off, it was in the middle of winter and I’d put the fire on and sort of made a game out of it… We’d dance in the dark with a couple of candles and the fire going so she didn’t get distressed about it. Lyn and her daughter used public showers and cooked on park BBQs. Lyn’s situation had a significant impact on her mental health, to the point where she was suicidal. I ended up getting so depressed. I remember going to bed one night and thinking my daughter was better off without me… The thing is you feel like you’re on your own. One day I just dropped in the middle of the lounge room floor and just started bawling, and I cried for hours and hours… You end up feeling like a complete failure; they push you to feel like that. 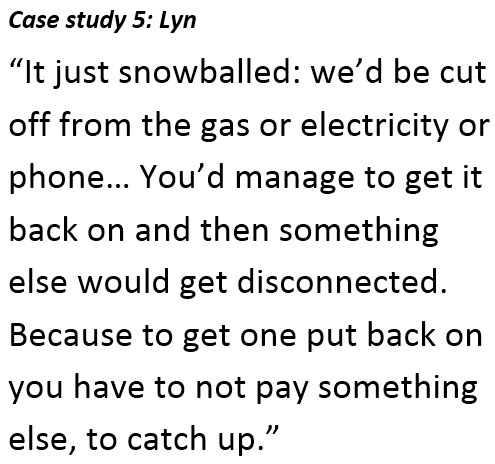 No retailer ever referred Lyn to a financial counselling service. Eventually, a Centrelink worker sent her to Kildonan Uniting Care. Lyn arrived feeling desperate. I leant across the window and it said financial counselling, and I just went in. I had no idea what they were going to do… But it was the best move I’ve ever made. Even though there [were still] times I got disconnected, through the help of a financial counsellor they would get it put back on. The counsellor discovered Lyn was eligible for the Medical Cooling Concession, as she has a nervous system condition. Her retailer had never mentioned this, even though she told them about her condition many times. Lyn has been on hardship programs at times, but she says it can be difficult to get accepted. It depends on who you’re talking to at the front line. [One woman] said, ‘you don’t need to go through to the hardship area, I can help you’. But she didn’t help me… it’s like you have to stand up them, like standing up to a bully in a way. That’s what it feels like. But Lyn says once the financial counsellor gets involved, it’s a different story. Ultimately, Lyn wants retailers to treat people in hardship situations better. I do think it comes down to them showing compassion, understanding and listening properly. That would be my advice; and treat everyone on an individual basis… Offer them some support services that are out there. This story is an excerpt from Consumer Action Law Centre’s ‘Heat or Eat’ report. If you’re struggling to pay your power bill speak to a free and independent financial counsellor on 1800 007 007 or head to http://www.moneyhelp.org.au for more information. We also offer fact sheets with advice on electricity and gas debt available here. Consumer Action is available for media comment. Contact 0413 299 567 or media@consumeraction.org.au.